Lou Bottone, Harry Muscariello, Joe Pallo, Mike DiBella, and Jim Krazit in front of today's O. DiBella Music store in Bergenfield, NJ. With its centennial in sight, O. DiBella Music stands among the oldest family-owned music retail businesses in the country. Still run by members of its founding family, the Bergenfield, New Jersey, store holds its own against two nearby big-boxes with an Old World formula: a wide range of products, services, and revenue streams; a knowledgeable and exceptionally loyal workforce; and a top-down respect for employees and customers. Around the turn of the last century musician Onofrio DiBella emigrated from Italy to the United States. For a short time, to supplement his income from giving mandolin lessons, he swept the floor of his uncle's barber shop. But when he noticed that musicians in his neighborhood couldn't find printed music from their homeland he responded by importing it, eventually forming a publishing business that concentrated on festival band arrangements and sheet music for mandolin, guitar, and accordion. It was a successful business, but as that genre of music faded DiBella got more involved in retail, starting a modest store under his apartment on 2nd Avenue in Manhattan. In 1924 he relocated the business to a former public school on 116th Street near the famed Apollo Theater in Spanish Harlem. 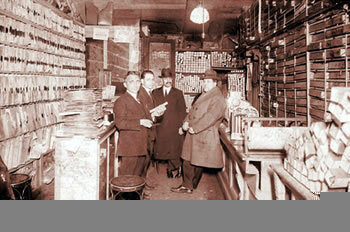 Onofrio's son, Michael, joined his father's business around 1936. The store's clientele was as diverse as New York itself. The DiBellas' Italian served as a common language for the Spanish-speaking customers, and, reflecting the local culture, the store's product mix included bongos and congas built on the premises. For a time it also offered a huge selection of phonograph albums, and it was one of the first Gibson Guitar franchises in New York City. By 1966 the inconvenience of the daily commute to Manhattan from his home in Fort Lee, New Jersey, inspired Michael DiBella to relocate the business in Bergenfield. 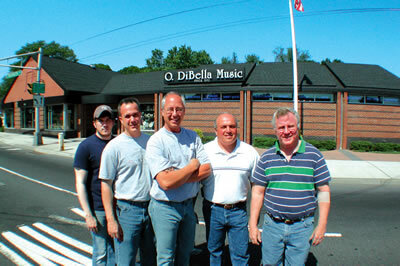 Today O. DiBella Music is headed up by Mike DiBella, Onofrio's grandson, and his brother-in-law, Harry Muscariello. Mike began working in the store during high school and college, learning "every nook and cranny of the business the old-school way. When I was really young," he recalls, "my father would hand me a guitar and say, 'Restring this.' A few years later he'd say 'Put frets on this guitar' or 'Re-pad this saxophone.' By the time I was an adult, I was good at it." founded on 2nd Avenue in New York City. Though it was "expected" that Mike would eventually work in the family business, when he graduated from Bryant College in 1981 with a BA in accounting he took a position with Volkswagen of America, as a liaison between the accounting and marketing departments. When Volkswagen moved its headquarters to Michigan two years later he returned to his roots, gradually shouldering more of the store's management responsibilities. Michael DiBella, who had remained active in the business until he was slowed by a stroke in 1996, passed away in January 2005. The employees and customers remember him as "a caring old-school guy who loved his business and his repair shop. He could fix anything." Mike DiBella attributes much of the store's success in recent years to exceptional stability of its sales force. "There is no employee turnover," he says, then adds with a laugh, "I couldn't get rid of my guys even if I wanted to." O. DiBella's employee retention is epitomized by Jim Krazit, who was still in high school when joined the company in 1968. After college he left to play in a band for a couple of years before returning the store full-time in 1973, specializing in stringed instrument repairs. "The work is interesting," he says. "There's a different challenge every day. We have customers from George Benson [who lives in nearby Englewood] to the kid who just started last week." Joe Pallo's first contact with O. DiBella was as a sales rep for Kaman. In 1993 he took a position on the other side of the counter, specializing in print music and accessory sales. Though he's not an O. DiBella blood relative, he jokes, "I consider myself the adopted son of the family." From both perspectives Pallo has gained an abiding respect for values that many in the industry lament are becoming increasingly rare. "I have seen supposedly stable companies like IBM take people in, make promises to them, and then say, 'Sorry, it's time for you to leave.' Unlike companies that just look good on top but end up crumbling underneath, O. DiBella is a family business with a foundation of rock." According to Mike, a number of the store's current salespeople started sweeping its floors before they finished high school. "Now they're out of college and they're still here. The store has become home to them. They're a good group of guys. I treat them with respect, we share in the profits, and I scream at them when there are no profits. [laughs] They're not 'techniqued' salespeople, but most of them are musicians, and they're all really knowledgeable about the products. Our guitar guy, Harry ['Jack' Jacovou], makes most reps' heads spin with his knowledge of their products. He's a nut - he reads every spec sheet and publication about every product. He's a gem. Andre's really good with the p.a. and DJ gear; Les is great with keyboards." Mike asserts that the constancy and dedication of O. DiBella's sales staff, along with their genuine desire to help their customers, has been a key to building a loyal clientele. "With the big-box stores, every time a customer goes in he has to start from zero in terms of trust, and it's just not as comfortable. Here, when someone comes in needing an adjustment on his guitar, he knows exactly who to ask for, and he knows that that person will do a good job for him." a teacher with her print music selection. Pallo adds, "From being here for so long, collectively we've seen every imaginable problem that music retail customers might have. Also, over the years we've dealt with so many manufacturers and lines, in addition to considerable knowledge we've acquired a vast collection of products and parts, so that if a guy comes in asking for a strange wing nut for his 1950s drumset, we'll dig around for a few minutes and get it for him. This has been a service-oriented store, one that stocks parts and helps customers, from the beginning." Though the ethnic mix has changed a bit since O. DiBella's days in Spanish Harlem, the store's clientele is still diverse, and the staff is even more equipped to serve any special needs and preferences. For example, Young Nam Kim, who was born and raised in the U.S., speaks fluent Korean, which facilitates "a certain comfort level" for customers from the area's sizable Korean population. Two other employees speak Spanish, a plus now as it was in Spanish Harlem, and one, Harry Jacovou, speaks Greek. Asked if this too comes in handy, Mike laughs, "Hardly ever - but every now and then he surprises a customer who also speaks Greek." For more than 30 years O. DiBella was squeezed into the former Capitol Music building, which was basically a modest frame house on the south side of Bergenfield. In 2001, after an awkward transitional relocation to a space downtown, O. DiBella returned to a new purpose-built store on the original site. It features a 6,500-square-foot showroom; a full basement that accommodates ten lesson rooms, a repair shop, and storage; and a small loft office for administrative and bookkeeping functions. The showroom includes areas dedicated to print music, digital keyboards, drums and percussion, guitars and amps, and horns and orchestral strings as well as semi-discrete rooms for basses and amps, high-end guitars, and pro audio and lighting. O. DiBella's square-footage doesn't compare with its big-box neighbors', but it is favorably distinguished by the selection within each department and the range, including categories such as school band instruments that aren't addressed by the big chains. "Customers who go into the big stores are immediately impressed by the big, perfectly organized presentation of gear," Pallo concedes. "But they're also likely to see exactly the same top-selling products from store to store. Here they find some neat products that didn't make it into the big stores' playbook. We look out for items that those stores don't carry." Occupying the gaps in the big chains' product and service offerings remains one of the keys to O. DiBella's success, although its full-service approach predated the chains by a couple of decades. Most obvious are its lesson program, whose 30 teachers serve up to 400 students a week, and a school band department that's supported by a robust rental program. "Our lessons don't generate a lot of net revenue," Mike admits, "but they bring a constant flow of kids and parents through the store. They give us an opportunity to establish a relationship with the next generation of customers." The big-picture value of the education program is reflected in Mike's linking it to store promotions. "For example," says Pallo, "when schools request a donation for fundraising activities, rather than donate a toy or something that makes just a momentary impression, we'll give them a gift certificate for lessons. That does a good thing by exposing the winner to music education, but it also brings them into the store where we can make additional impressions on them and their parents." O. DiBella services northeast Bergen County schools with five of its total 14 salesmen, including Mike DiBella, working as on-call road reps. Pallo notes that serving the school music market helps smooth out the store's normal income cycles. "Stores that don't do school rentals can find that September is a slow period," he says. "But that's the time when we have lines of people going out the door waiting to rent instruments." 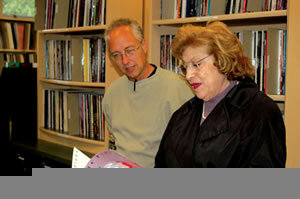 O. DiBella's school music business accounts for roughly 30 percent of the store's revenue. 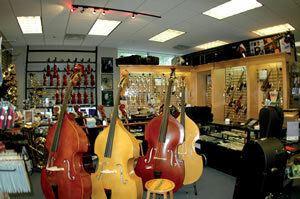 To better serve that market, in 2003 Mike DiBella added private-label instruments to the store's lineup. Some are branded "456Music" (which references the store's street address of 456 South Washington Avenue). A "particularly nice" oboe bears the "Onofrio" brand, honoring his grandfather. "We don't sell any junk," Mike states flatly. "It's all decent quality stuff." Any misgivings he has about forfeiting sales of higher-priced instruments are overridden by the realities of the current school band market. "We always make the customer aware that to some degree you get what you pay for. We tell them that a $495 sax will get them through a year or two before they'll want to step up to something better. But if we don't offer lower-priced instruments, some consumers will find one on the internet or at a mass-merchant anyway - even if it's a parent stumbling upon an $89 flute at Costco as he's shopping for the large rolls of Scott tissue." Mike cites the absurdity of retailers perpetuating a "40-off mentality" and "beating each other over the head with discounts." Nevertheless, he keeps a vigilant eye on competitors' prices and insists, "Our strong customer service will usually win the battle if our pricing's the same." As tighter margins increased the pressure to order wisely and keep the inventory lean, O. DiBella deployed an increasingly popular resource: eBay. "It's a wonderful dumping ground," Mike says. 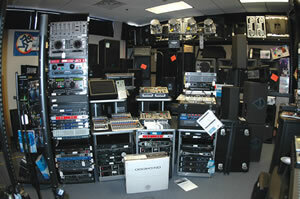 "When we hold a blowout sale at the store, customers end up taking the viable product and leaving the old stuff behind. eBay has turned our straggling product into cash. Surprisingly, most of the time we recoup cost or just below cost, which is beautiful." Further profit opportunities arise from sound system installations, another service that distinguishes O. DiBella from its major competitors. This "sideline" has grown largely due to positive word of mouth among O. DiBella's clients, who typically include churches, schools, and the occasional nightclub. O. DiBella also sets up temporary audio systems and operates sound for major events such as street fairs, concerts, and celebrity parties. Their crew recently provided a system and ran sound for Sarah Jessica Parker's birthday party at the Plaza Hotel. "[Sound operation] is just one more source of income for the store," says Pallo, and it typically comes in the summer, in the dead of July, when some of our competitors' business is slow." O. DiBella's website, 456Music.com, provides an additional significant source of income that reaches customers far beyond its local clientele. With one employee dedicated to responding to web-order inquiries, the site generates approximately ten percent of the store's total business. for a group of O. DiBella customers. Over the years O. DiBella has tried all the standard forms of store promotion, including coupons, brochures, local magazines that target high-income households, and cable TV. The two vehicles that have consistently generated a response have been direct mail and "private sales" to loyal customers. "Conventional advertising hasn't been cost-effective for us," Mike says. "Our money's been better spent on the customer: We lower the price on something a bit or throw in an add-on such as a set of cable ties when they buy cables - all at the point of sale. We present it like we're doing them a favor - and we leave the price tag on the counter so they're sure to see it. Word of mouth is the best form of advertising, and if our customers have a warm, fuzzy feeling when they leave the store because we've done them a favor..."
"Our major competitors hold sale after sale," Pallo continues. "After a while those 'super-special, one-time-only' sales seem fake. Our promotions lean more toward educating the customer. We bring in a clinician who will explain a line's particular strengths. 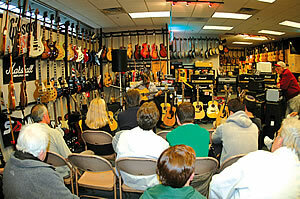 Tonight Richard Starkey is coming in to give a free presentation on Martin guitars. Our customers will leave that session thinking about buying a Martin not because they can 'buy one, get one free,' but because they've gained a comprehensive knowledge about Martin's 100 years of guitar building, its integrity, its quality, its warranty, etc. It's an educational approach, not a $10-cheaper-than-the-next-guy approach." But more than any events, promotions, or special sales, it's O. DiBella's friendly vibe and capable, caring sales staff that define it in the highly competitive northern New Jersey market. "There used to be a million mom-and-pop stores," muses 35-year veteran Jim Krazit. "We're not quite in that classic category anymore, where it's literally a little old mom and pop running the business, but we're a single storefront, we're family-owned, and our people know what they're talking about. The DiBellas have always been good to their customers, and they treat their employees like family. That's probably why the business has been around so long."